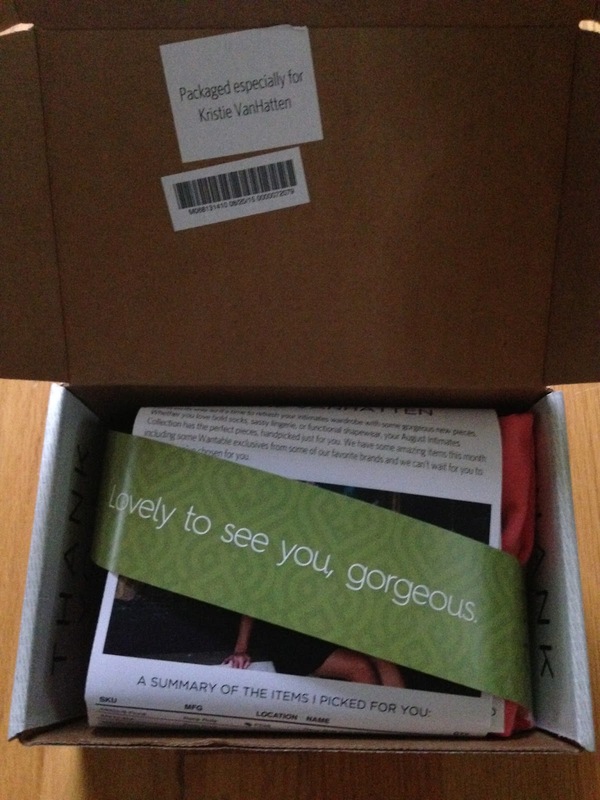 Every once in a while I like to get a Wantable Intimates box. I've always been fairly happy with what I've received from them and it seems worth the cost, but I don't need a box every month. I decided to get an August box, because I was seeing quite a few reveals with nice PJ sets. 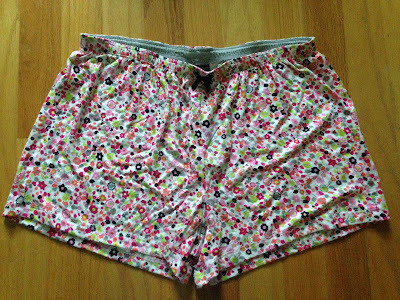 In my order I requested Rene Rofe PJ sets, because they looked adorable in everyone's reveals! When making specific requests, you never know if you'll get the items, but it's worth trying. I was so excited when the box showed up. And it always amazes me how tiny the boxes are. I always think it can't be anything more than a pair of socks inside, but they always impress me with what fits in the very small box. Here is a first peek at what was in my box. I love the cute sayings included. Wantable Intimates includes an order sheet with what is included in the box. 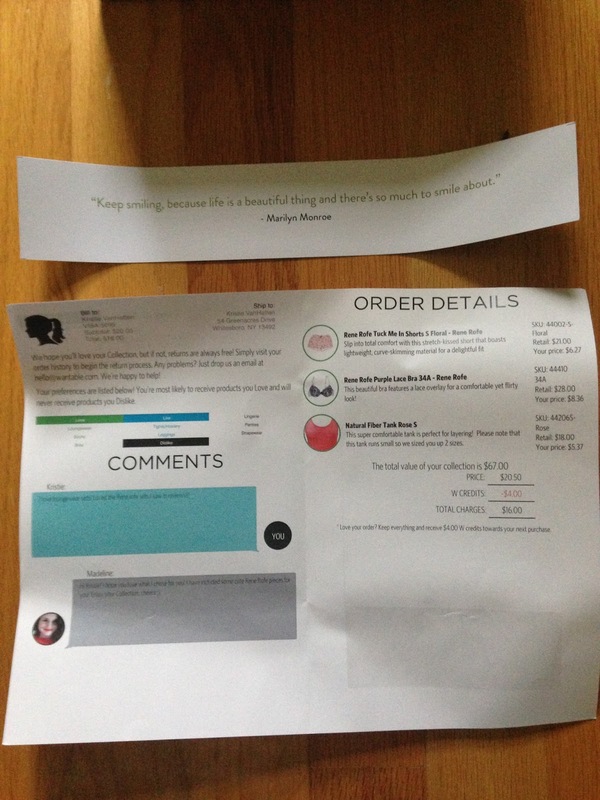 It also lists the retail prices and the amount you would receive for the item if you were to return it. 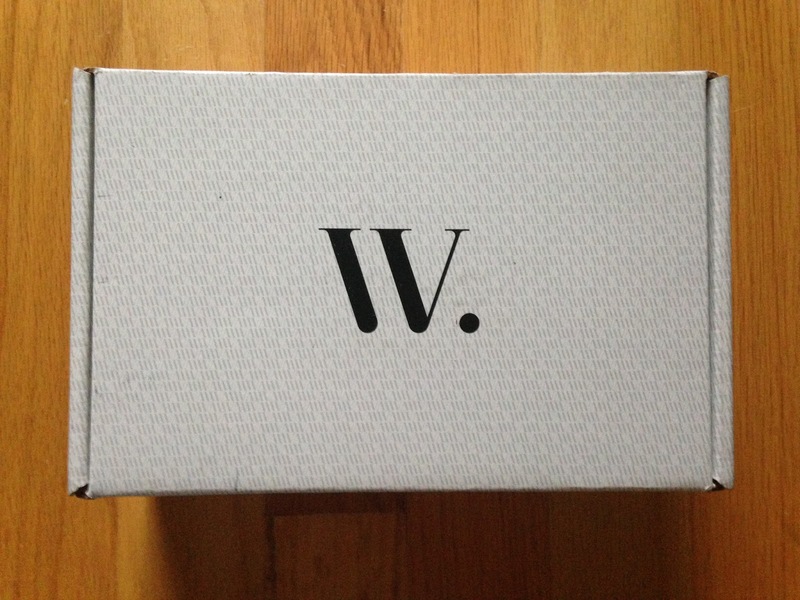 Wantable lets you return individual items, which I really like. So, if you love one item, but hate the rest you don't have to send the whole box back. A lot of subscription services do not offer this option, but I really think more should. Also, you fill out a profile when you subscribe and Wantable will only send you items you love or like and never what you dislike. It makes it so easy to get what you want, by changing your profile throughout your subscription. The first item I pulled out of the box was a Rene Rofe item. It wasn't cute PJs though. It was a Rene Rofe Purple Lace Bra. Retail price $28. This is a push up bra and definitely my style. This was something I would have picked out myself and will definitely wear. I love the neutral colored lace over the purple. This fits very comfortably, so I will definitely be keeping it. 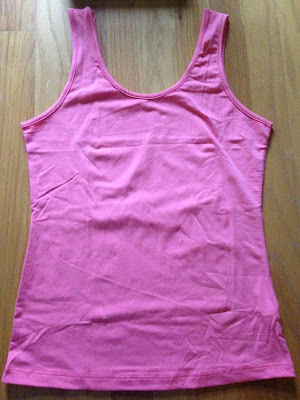 The next item I received was a Natural Fiber Tank in Rose. Retail price $18. This is a fun pink color and it's really comfy. I will wear this under shirts or to bed. I love tank tops and wear one almost every day, so this is another keeper. This is a great basic and I always love getting them because I know I can always use them. Plus this color will go great with my wardrobe! I normally wear a size small in shirts and Wantable sent me a size large in this tank, because it ran really small. It fits perfect! I love that they take that into consideration and I've never had an issue with things not fitting from this subscription. The final item included in my box was my favorite. It is Rene Rofe Tuck Me In Shorts in Floral. Retail Price $21. 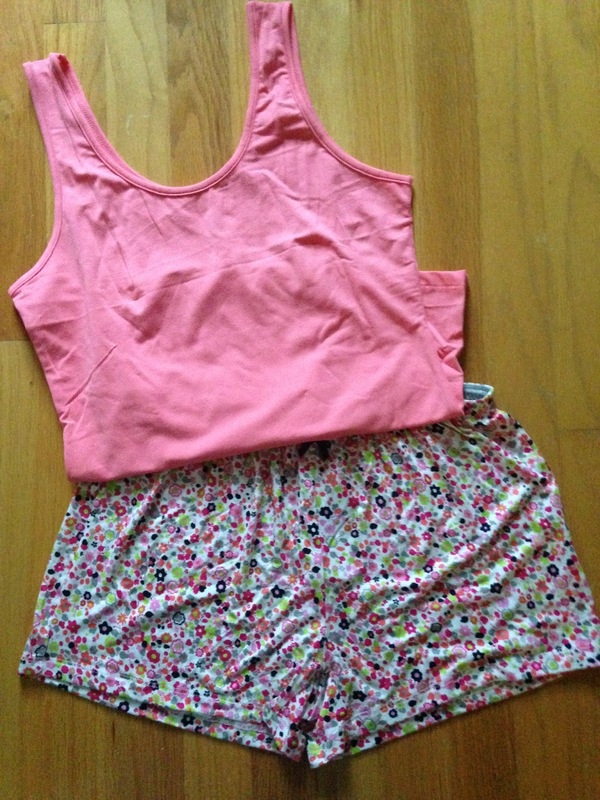 These are so adorable and the tank top matches. I love that! These are so soft and comfy and I love the print! These were exactly the type of item I was requesting, so I was so happy I got these. I'm keeping them, obviously! Look how great the shorts and tank go together. They make such cute PJs! This box was great and I was so excited I decided to order the August Wantable Intimates box! I probably won't get one for another few months. I just like to get a few unique pieces every once in a while, but every month would be too much. I'll be watching reviews to see if I really like anything I'm seeing and order again later. I really want some cute patterned leggings for Fall, so I'm hoping I see some. Then I'll be ordering again very soon.